340 pages | 31 B/W Illus. Antioxidants in Health and Disease discusses the effects of dietary antioxidants and antioxidant supplementation in humans. It reviews the latest evidence-based research in the area, principally through prospective cohort studies and randomized controlled trials. 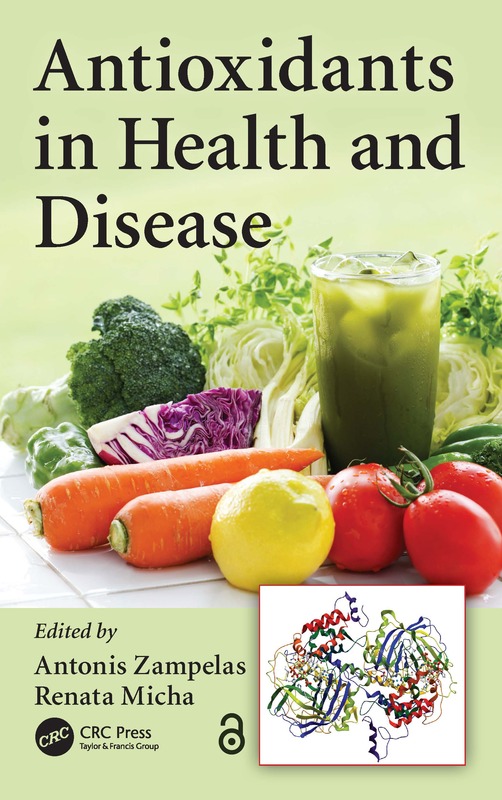 The book assesses major dietary antioxidants and discusses their use in diseases such as cancer, diabetes, stroke, coronary heart disease, HIV/AIDS, and neurodegenerative and immune diseases. The use of antioxidants in health is also discussed along with common adverse effects associated with antioxidant use. Separating myth from fact, this book gives you insight into the true role of antioxidants in health and disease. "For several decades now, popular media have been attempting to explain to the public the 'medical magic' of free radicals and their capture by antioxidants in the human diet. Opening a broad frontier in nutritional chemistry, the subject of the value of antioxidants requires better mapping by researchers because serious matters of health and disease are involved. This compilation comprises 16 chapters by 41 contributors (two from the US, many from Greece). Thirteen of the contributions focus on life stages, lifestyle, and disease—i.e., pregnancy, growth, old age, exercise, smoking, diabetes, cancer, neurodegeneration, gastrointestinal disorders, obesity, HIV/AIDS, immunology, and the circulatory system. The remaining three chapters cover functions and food sources of dietary antioxidants (especially herbs and spices) and various aspects of good technology and regulations. Because all the chapters read like contributions to scientific journals—and qualify to be submitted to any such journal for peer review—lay readers lacking background in the science will be challenged. Summing up: Recommended. Graduate students; researchers/faculty; professionals." THE INTEREST IN ANTIOXIDANTS: WHY AND HOW? Antonis Zampelas is a professor at the Department of Food Science and Human Nutrition of the Agricultural University of Athens in Greece and at the Department of Nutrition and Health of the United Arab Emirates University. He earned his master’s degree in food science from the University of Reading and a PhD in clinical nutrition from the University of Surrey in the UK. He worked as research fellow at the University of Surrey, as senior scientific officer at the Ministry of Agriculture Fisheries and Food in the UK, as assistant professor at the Department of Nutrition and Dietetics at Harokopio University and as president of the Hellenic Food Authority in Greece. Professor Zampelas’s research interests are in the field of cardiovascular nutrition and include conducting intervention studies and developing nutritional educational programs for Greek school children to prevent childhood obesity. He is also the principal investigator of the Hellenic Nutrition and Health Examination Survey. He has held leadership positions at various professional associations and committees. He has written or contributed to more than 120 peer-reviewed publications in international scientific journals and is the coauthor of 20 textbook chapters. Renata Micha is research assistant professor in the Gerald J. and Dorothy R. Friedman School of Nutrition Science and Policy at Tufts University; and the director of the Hellenic National Health and Nutrition Examination Survey (H-NHANES) in the Department of Food Science and Human Nutrition at Agricultural University of Athens. Dr. Micha is a registered clinical dietician, public health nutritionist, and epidemiologist whose research focuses on global diet assessment and surveillance, the effects of diet on chronic diseases, mainly cardiometabolic diseases, and on population strategies to improve diet. She received a degree in nutrition and dietetics from Harokopio University of Athens, Greece, a PhD in public health nutrition from King’s College London, UK, and completed a postdoctoral fellowship at Harvard in Nutritional and Cardiovascular Epidemiology. Prior to being appointed Research Assistant Professor at the Friedman School, Dr. Micha was Research Associate in the Department of Epidemiology at Harvard School of Public Health. Dr. Micha has received several awards and honours, and is an ad hoc manuscript reviewer in international journals, including the New England Journal of Medicine. She has authored more than 40 publications on diet and cardiovascular health in high impact scientific journals, such as the New England Journal of Medicine, Lancet, British Medical Journal, Circulation, and PLoS Medicine.